It’s easier to shop at grocery stores now that I have a family. Back when I lived by myself it was hard to get food in reasonable quantities. Luckily I have a tolerance for repetition of flavor. I would frequently eat the same meal for breakfast, lunch and dinner for a few days in a row. It’s not so much of a problem now that I can share. More useful than a Foreman(TM) grill, and you get to play with (small) amounts of fire, too! In days past, when I was sans family, too, I was known to sometimes grill a weeks worth of food, and live off the same meal leftovers the whole week. I am at a stage in my college life where I am eating mostly Eggo waffles and chilli. I live alone, and I don’t have that problem — of course, I only eat once a day (supper, around 6 P.M.); so I eat a larger portion than most people who eat three times a day. i find that the freezer is always a necessity when single; nothing finer for the diet than frozen burritos, chicken and pizza! It is sad when the freezer has more food than the fridge. Is it sad that sometimes grocery shopping for me is just a loaf of bread, a jar of jam, and a jar of peanut butter, all of which i buy at 2:00am? 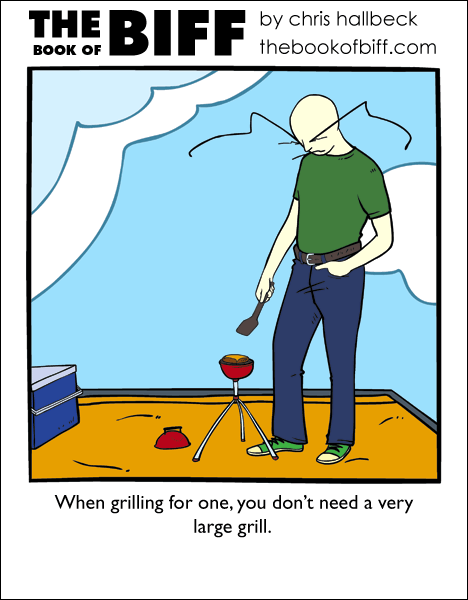 Poor Biff… cooking out by himself… Maybe he should’ve let the ants come. Ah I remember having this problem. I solved it by buying the Family pack of chicken discounted and then inviting a pile of friends over, otherwise I’d end up frozen burritos. Ooh, does it come with mini scraper and all? I want one! I only have a frying pan…it’s too big for hamburgers and too small for bacon. Great as always Chris, keep on! why is biff grilling a veggie burger with cheese rather than a cheese burger dose the little grill not get hot enough and I only know it’s a veggie burger (not cheep veggie burgers ether it looks like one of the more expensive one the ones that are passable) because I have the ability to tell a veggie burger from a hamburger form a distance its one of my many strange gifts. i’ve tried living off of pizza n cereal for a couple days at a time… my digestive system usually starts complaining at that point. i’ve found it’s not hard to make other stuff w/ a stove & frying pan, though. Is Biff floating in the sky? I knoew how that is. I constantly have to throw food away. I’m a student and me and my current housemates don’t exactly have the same taste when it comes to food, so I often buy my own stuff and end up binning half of it. I try to freeze stuff when I can, but the freezer is not very large. Heh. I’m currently dealing witht he other side of the issue – I spent a lot of time cooking for only one or two, and we just had a new roommate move in, plus having a houseguest for the past week. Four people make a LOT of dishes – considerably more than 4 times as many as one person! I like him being on the gravity pad. 🙂 And he must be upside down, actually. O.O Arent disposable grills a big waste of resources? I hope hes using the GrillOMatic, the type that dont get thrown out. On another note, my stepfather, as much of a jerk he may have been at times, was KIng of the Grill. Man, to bite into one of his prime ribs or chicken was to experience the utter joy of grilling to perfection. My stepdad is the Grill King. I always felt like I was getting stared at when I’d get, like, a single tomato or a couple hungry-man dinners. Ahaha, yeah, I’ve done the Shopping For One thing. What’s almost as awkward is shopping for three. You can get portions for two or four easily, but one and three? Noooope. Yup, I’m doing the shopping for one thing at the moment. Sometimes, having a family to eat with is a minus more than a plus. I live with my parents while I’m in college, and although breakfast and lunch are made and eaten at my discretion, dinner is something that is collectively decided upon. There’s only three of us in the house, but we can never come to a decision. Plus, with the wierd hours my parents keep, it’s almost impossible to find time to actually cook dinner, so roughly 8 times out of 10 we’ll decide on some form of fast food. It bothers me because “Add” is misspelled. There’s only one ‘d’, the proper abbreviation is “Ad.” Used to be “Advert”, maybe you’d prefer that? “Ad” seems more like slang. Biff looks . . . lonely . . . and bored. More so than normally. @ Chris & AdmiralChaos – what was it before? I can imagine how it feels, since I work in a grocery store =3 It’s really not that akward to buy stuff for one, imo. I’ll probably be doing it within a year or two anyway, but who knows. also, I want one of those for camping (or a slightly bigger one, but not by much). I cook 4 or 5 meals for 4 on my day off, then divy into portions and freeze, then i have a mix through the week. Ha! I’d love a tiny BBQ to cook single things on! A lot of Biff’s inventions are silly but some are truly magnificant novelty items I’d love to own, hehe. As a student I too find buying food for one a bit of a chore. I’m yet to make it through a full loaf of bread before it expires, even a smaller size one. Thankfully I’ve been sharing a lot of my food (and therefore the price too) with my girlfriend which has made things much easier. damn ,, and i was hoping to be the only one who noiticed hes on the gpad…. Is biff standing on the anti gravity plate? It looks like it, but there’s no shade. My brother actually had a grill like that, though iut came with the big grill. I’m sirprised no one was aware of them before. When I shopped for one, it’s not like anyone could tell, as I always bought for a month at a time. When one lives an hour from the nearest city / grocery type store, one’s day off is consumed with errands that take city dwellers so much less time to complete. Also, gas was expensive. I wnat a tiny grill now. Poor lonely Biff! He needs a friend… or a girlfriend.